FORMER superintendent of prisons Lim Chong Teng used to earn more than $8,000 a month running a cell block at Changi. 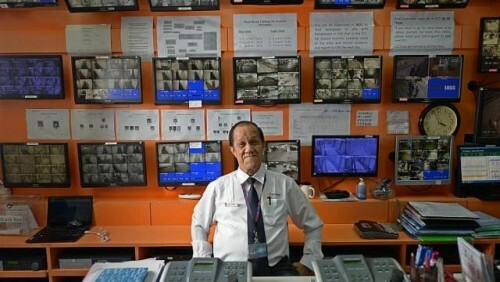 The 66-year-old, who left the Prisons Service 11 years ago, is now getting $3,000 as a site operations manager for security firm Soverus. But he is not bitter about the pay cut. "What is past is past," said the father of two grown-up children. "When we do different work, it is very fair that the salary changes." Such a view is shared by many older Singaporean workers. Of the 50 workers aged above 55 interviewed by The Straits Times yesterday, 70 per cent said they want to work beyond 65, even it means getting less pay. The rest want to retire by that age to spend more time with their families and on their hobbies. In his May Day Rally speech on Thursday, Prime Minister Lee Hsien Loong gave the clearest indication yet that the Government will extend the re-employment age. Currently, healthy workers who hit the retirement age of 62 must be offered re-employment until 65, or a one-off payment. "We will get there," he said, referring to current talks with unions and employers to extend the ceiling, possibly to 67. No timeline was mentioned, although union leaders hope to conclude talks by the end of this year. Older workers are eagerly anticipating the extension, for different reasons. Close to 60 per cent of those who told ST they are willing to work beyond 65 said they enjoy working as it keeps them connected with society. Stockbroker Dave Chan, who is 60, said: "I look forward to work every day. Meeting colleagues and clients keeps me happy." Mrs S.M. Chia, a 57-year-old sales manager at a financial services firm, added: "I would like to be a mentor to the younger staff and pass on what I learnt." The other 40 per cent want to keep working because of financial commitments such as house loans and school-going children. Said 55-year-old cleaning supervisor Wong Choy Pheng: "I have to work until my last breath." Her husband is a repairman and they need to support a teenage son with special needs. The family is also moving to a new three-room Housing Board flat later this year. However, those polled raised several concerns about pay cuts. One was that such cuts should correspond to the lesser workload. Workers also hope that their firms can redesign their jobs to cut stress. Said secondary school teacher Peter Ong, 62: "If I no longer need to be a form teacher or be in charge of co-curricular activities, then a pay cut will be fair." Mrs Andrea Lew, 58, a senior accounts manager, said: "I love to keep busy. If there's some way there could be an easier version of my job, I'd certainly embrace it." While older workers said they appreciate the move to raise the re-employment age, they pointed out that some bosses are already urging them to continue working as long as health permits. Construction firm human resource director Foo Yoke Heng, 59, said: "My boss told me, 'don't think about retiring'. That makes me happy because I know my efforts are appreciated."